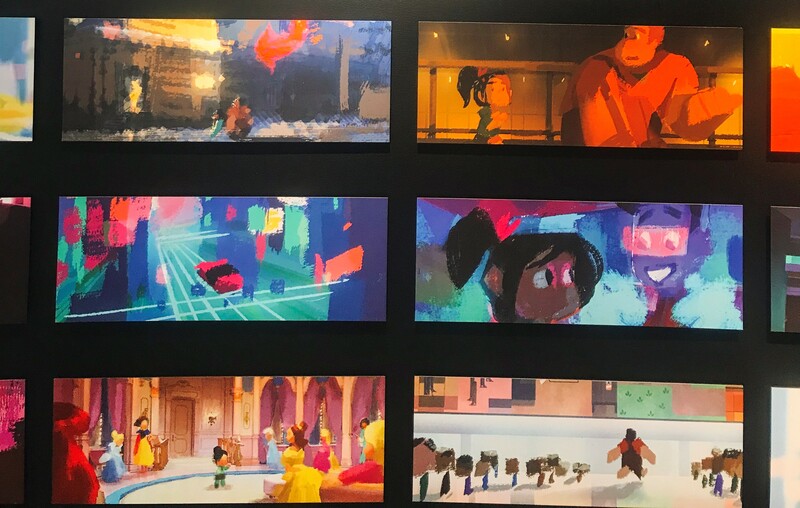 I recently attended a press day to remember at Walt Disney Animation Studios, for the Blu-ray re-release of The Little Mermaid and the Blu-ray release of Ralph Breaks the Internet. To kick off the day, we got to watch the Ralph Breaks the Internet bonus features, and have a Q & A with producer Clark Spencer, director Rich Moore, and director/co-writer Phil Johnston. The journey of creating the “world of the internet” began with how most Disney Animation Studios films begin…with a research trip! Johnston and Moore talked about their trip to One Wilshire in Los Angeles, a building that houses all the internet communications for the west coast. The structures inside the building largely inspired how the internet looked in the film. (This journey is also showcased in the bonus features!) With the internet being so vast, they wanted to make sure to incorporate a lot of websites big and small. A fun fact we learned, is that you don’t need permission to show a site’s logo in a film, so showcasing many websites in the world of the internet wasn’t a problem! Also with the environment of the film being made up of so many pieces, Moore and Johnston were able to include lots and lots of “Easter eggs”. There are some that are easy to spot, and then some that are incredibly tiny that probably only the animators would ever know they’re there. (There’s a bonus feature on Easter Eggs, so you can get an up-close look at some of the harder to spot ones). Having a movie set in the world of the internet also gave Disney the unique opportunity to put hundreds of Disney’s own characters in one space, when Vanellope visits “Oh My Disney”. During the visit to Oh My Disney, there is of course the iconic “princess scene.” The scene, which includes every Disney princess, are also all voiced by the original voice actresses (with the exception of Snow White, Cinderella, and Aurora). Johnston and Moore said that they came together for the first time in the same room when they showed the scene at D23 Expo 2017. Johnston said having most of the voice actresses up on the stage at once in front of an audience filled with Disney fans was liking having a Beatles reunion! During the creation of “the princess scene” they were able to work with animation supervisor Mark Henn, who was involved with the animation of many of the princesses (Ariel, Belle, Jasmine, Mulan, Pocahontas, and Tiana). He came on board to help consult with the animators on the specific expressions of the princesses. The voice actresses also had a hand in tweaking the script a little, recommending how lines would be said in their characters’ specific voice. Next up, we were able to meet with Scott Kersavage (Visual Effects Supervisor), Ernest J. Petti (Technical Supervisor), and Bradford Simonsen (Associate Producer), who talked about the technical aspects of building the world of the internet. They wanted the environment to be largely inspired by computer hardware, but escalate it to a larger scale to help make it look like a real city. Building such a massive environment of course meant lots of different people, assets, scenery. The movie was made up of 150 unique sets, 5736 unique assets, and 100,000 elements, equating to about 1.9 million render hours/day. One scene that presented animators a whole new challenge was “Ralphzilla”, aka the giant Ralph made up of a bunch of smaller Ralphs that were cloned during the virus outbreak at the end of the movie. When characters interact with each other in an animated film, you have to teach the computer to recognize when another character touches them, so that you don’t have an arm going through another arm, the computer needs to recognize when a character touches a physical barrier to not go through it. To create Ralphzilla, they were going to have to teach millions of characters this. When Ralphzilla was completed, he was made up of 5,443,098 moving Ralph characters! It was a difficult, yet new and exciting challenge the Disney animation team was determined to accomplish! Lastly, we interviewed Alan Tudyk, who plays Mr. KnowsMore. Tudyk has now done voice acting in many Disney films, but his first role with Disney Animation Studios was as King Candy in Wreck-it-Ralph. It definitely goes to show how versatile he is as a voice actor! In our interview with Tudyk, he talked about how he was asked if he could do an Ed Wynn imitation, prior to being cast as King Candy. He said he had never tried before, but his agent said “Well I told Disney you can do one, so you have to go for it!” And he 100% nailed the voice! Tudyk said as a voice actor, he develops voices in different ways. Sometimes when he sees a character design, a voice comes to his mind naturally to fit the character. Other times the directors have specific ideas of what they are looking for. In the case of Mr. KnowsMore, Rich Moore said he was looking for a voice that was part Truman Capote, part Droopy Dog. Tudyk went home, watched videos of Truman Capote, and added Droopy Dog-esque inflections, and voila, the voice of Mr. KnowsMore was born! A couple other fun facts about Mr. KnowsMore, his character design was inspired by Professor Owl, who introduced the Disney Singalong songs videos! To help give him kind of a similar feel, his eyes that move around within his glasses were hand drawn by Mark Henn. Ralph Breaks the Internet is available on digital February 12, 2019, and available on Blu-ray and 4K February 26, 2019. Also on those same dates, the 30th anniversary edition of The Little Mermaid will be available for purchase. You can download printable Ralph Breaks the Internet coloring sheets and activity pages here.